We are very excited to bring taiko legend Leonard Eto to the Bay Area for a very special series of workshops on June 18-19th. Registration is now open! Please scroll down to register. In 1984, Leonard joined KODO and soon became the principal performer, musical director and composer. His compositions for KODO: “Lion,” “Irodori” and “Zoku” propelled the group to new artistic heights. He is the creator of the modern katsugi style of playing, slinging the instrument over the shoulder so that the player could walk and dance while playing the drum. In 1992, Leonard left KODO to pursue a solo career and has collaborated with many great artists ranging from Bob Dylan, Bon Jovi, The Chieftains, INXS, Ray Cooper, and Roger Taylor to world music superstars Zakir Hussain and Doudou Ndiaye Rose. His original compositions have been featured in films such as “JFK,” “The Lion King,” “The Hunted” and “The Thin Red Line” and in performances by master ballet dancer Patrick Dupond and figure skater Elvis Stojko. Leonard has also collaborated with renowned Ballet National de Marseille, modern dance company Pilobolus, and master ballet dancer Nina Ananiashvili. The main appeal of the katsugi okedo style is the ability to mobilize one’s body while playing the instrument. Controlling the instrument with your body and motion is one of the most difficult aspects of the katsugi style. 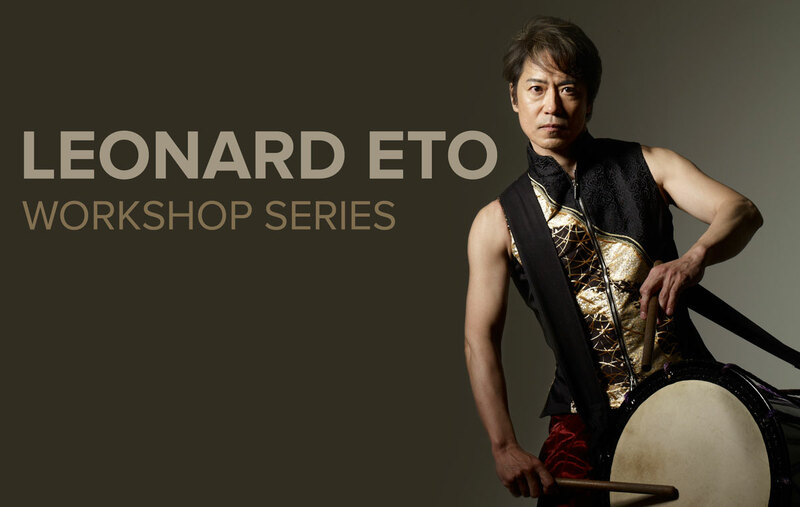 In this workshop, Leonard Eto will use various rhythms to develop full control of the drum through bachi motion and body weight shifting techniques. As part of the process, he will also cover Katsugi maintenance including how to tune and tighten the drum, optimum strap length to the player’s body, and bachi selection. Leonard Eto has requested we keep the small workshop small so that he can give personalized advice to each participant. Leonard will also share his stories behind developing the style back in the 80s. In this workshop, Leonard will lead the participants through a creative process to create a improvisational piece based on each participant’s personality and experience. Participants will learn how to listen to what they are playing while listening to others and be able to recognize the interlocking structures. The goal is to build and feel the “groove” – the most exciting part of ensemble playing. Leonard used this same method to compose his famous piece “Zoku” while with KODO. He will use lines from “Zoku” to develop the group’s own groove and character. He will also teach how to utilize the weight of your arms and bachi to play efficiently and bachi control techniques that can create different tones on the drum that will add depth and creativity. All workshops will be held at San Francisco Taiko Dojo: 212 Ryan Way, South San Francisco, CA 94080 (Tel: 650-583-4900). We will have some Katsugi available for those who aren't able to bring their own. Cost: $10. The BBQ Dinner will be held at SFTD, same location as the workshop. I HEREBY ASSUME ALL OF THE RISKS OF PARTICIPATING IN ANY/ALL ACTIVITIES ASSOCIATED WITH THIS EVENT, including by way of example and not limitation, any risks that may arise from negligence or carelessness on the part of the persons or entities being released, from dangerous or defective equipment or property owned, maintained, or controlled by them, or because of their possible liability without fault. I certify that I am physically fit for participation in this activity, and have not been advised to not participate by a qualified medical professional. I acknowledge that this Accident Waiver and Release of Liability statement will be used by the event holders, sponsors, and organizers of the activity in which I may participate, and that it will govern my actions and responsibilities at said activity. Please review your information one last time, and click "Register Me!" to submit your application and payment. You can always reach us at info@kadon.com with any questions!